At recent search engine marketing conferences in Chicago and New York (#SESCHI #SMXEast), Google’s Hummingbird announcement was the hot topic, generating endless buzz from industry experts and creating equal unease in the SEO community. Hummingbird is basically a flashing neon sign announcing that Google has shifted its primary search algorithm from keyword matching to semantic search – that semantic SEO isn’t a trend; it’s the new norm. The announcement triggered an intense new focus on how to get semantic markup done STAT . 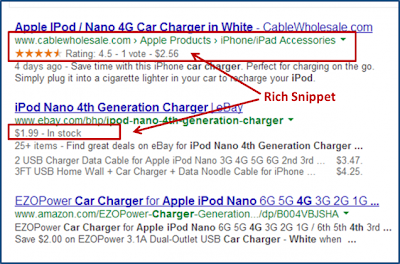 . . and then how to earn the Rich Snippet enhanced listings on Google. At some point, almost every conversation swirled around Schema.org markup and Rich Snippets, and many of them included a version of this crazy-making anecdote: “I implemented Schema.org markup about a month ago, and my search listings began to get Rich Snippets. But yesterday, all my Rich Snippets disappeared. What’s up with that?” To explain this unnerving phenomenon, we need to backtrack a bit. 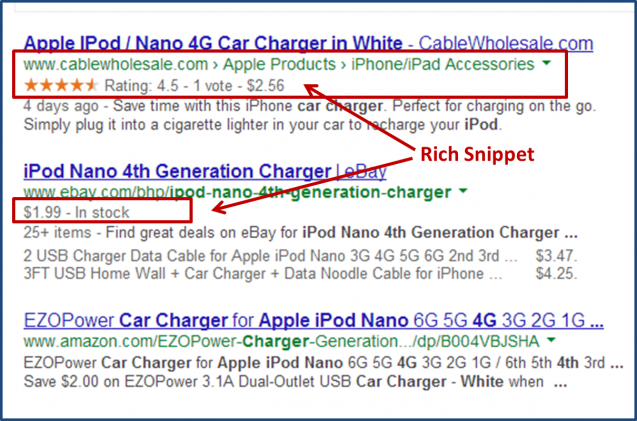 Rich Snippets is a term used by the search engines for the enhanced listings on search engine result pages (SERPs). For e-commerce products, Rich Snippets typically include elements such as star ratings, number of reviews, product price and availability (in stock or not). For content articles, they include attributes like author, title, image, ratings, and publication date. Rich Snippets make a listing stand out from the crowd and trigger higher click-through rates. The details in Rich Snippets (ratings, reviews, images, etc.) make it much clearer exactly what’s on the site. So when you click, you know there’s a greater likelihood of finding exactly what you want, which leads to higher conversion rates. More traffic, better qualified users, increased conversion rates . . . no wonder websites are chasing Rich Snippets. And no wonder they’re thrilled when they get them, and freaked if they disappear. To earn Rich Snippets from search engines, your products/articles should contain Schema.org markup and the semantic markup “vocabulary” adopted as a standard by Google, Bing, Yahoo! and others and now considered the global standard by the W3C (the World Wide Web consortium). Once you implement Schema.org markup on your site, Google analyzes the markup on a continual basis and, eventually, may award you a Rich Snippet like the ones highlighted in the comparison below of three product listings. One has a full Rich Snippet, one has a partial Rich Snippet, and the third was not awarded a Rich Snippet in this particular SERP … even though all three have been awarded full Rich Snippets in other search results. Proper Schema.org markup helps search engine crawlers find your products and web pages more easily. But that’s not all. They also increase Google’s “trust” in your site, because the markup helps Google verify what is actually on your pages/site. When Google “trusts” a website, it’s likely to rank it higher than sites it has reservations about. Even without a Rich Snippet being awarded, the Schema.org markup is important so the web page is included as a relevant result to a search query in the new semantic search algorithms of Hummingbird. In other words, although Google ranks sites and pages based on a number of factors, trust is a big deal. In short, Rich Snippets are excellent for users, sites, and search engines. So it’s no surprise that on SERPs, listings with Rich Snippets trend toward the top. Rich Snippets are awarded only after a site’s Schema.org markup has been thoroughly analyzed by Google. This can sometimes take five or six weeks. However, many sites have been awarded Rich Snippets in as little as eight days. But here’s the “but”: Google is The Decider. It can give and take away Rich Snippets for its own hidden reasons, at its own discretion, and it does. This mysterious, seemingly arbitrary give-and-take power is what sent stress levels soaring in the SEO crowd at SES Chicago and SMX East. Many people saw their sites’ Rich Snippets suddenly vanish and were afraid their rankings would, too. As a result, they’d spent hours trying to modify their code to prevent losing their Rich Snippets for good – even though they didn’t know why they’d lost them in the first place. But that’s probably not the right course of action! About 10 to 14 days after the Schema.org markup is done, Google will crawl a site and analyze the markup. If all’s well, Google will then award Rich Snippets to some of the site’s pages. In roughly 5 days, those Rich Snippets disappear, only to come back several days later. This cycle may be repeated several times, on the same pages or on a new set of pages. After about 8 weeks, if the repeated analytics don’t turn up any problems, Google will likely start awarding permanent Rich Snippets throughout the site’s products and articles when it matches all the algorithm criteria for any given search query. Google seems to be using this now-you-see-them-now-you-don’t cycle of Rich Snippets to do three things: perform analytics across their new Hummingbird algorithm, understand the effects Rich Snippets have on a site’s search-results performance (inclusion, ranking, clicks), and track whether those results match Google’s algorithm expectations. It’s not so arbitrary after all. The entire process of being awarded a Rich Snippet by Google can be exciting, frustrating, and time-consuming. But Hummingbird’s arrival has made it clear that Schema.org markup is a) no longer optional, and b) have to be done right to earn Rich Snippets. Manual coding is tedious, costly, and error-prone. DIY tools often work fine, though they have a learning curve. Automated implementations are fast, easy, and often the cheapest. Google claims that adding Schema.org markup won’t affect your rankings in search results but you should focus on having high-quality content that users want and share. Ignore the first and take the second to heart. While high-quality content is always vital, having Rich Snippets before most others do gives you an edge – it increases click-throughs and sharing, a combo that usually yields higher rankings. Leave your markup code as is for at least 8 weeks and just monitor the ups and downs of your Rich Snippets. They mean Google is continually analyzing your site. As long as your Rich Snippets don’t disappear for more than two weeks in a row, there likely isn’t a problem with your markup. If you panic and mess with your markup during this phase, you risk sending Google mixed signals about the authenticity of your web pages. If you’re genuinely worried about the correctness of your markup implementation, have someone in the know audit your site for errors before you make any changes. If after 8 weeks or so, you don’t have any Rich Snippets, or if you had some early on but they’ve been gone for weeks, something’s not right. If you never received any Rich Snippets, there could be errors in your Schema.org implementation. If you got some Rich Snippets initially but they disappeared permanently – without your making any modifications to your Schema.org markup – there are a couple of possibilities: If the markup was manual, not automated, there could be what are called coupling code errors; you’ll need a Schema.org pro to sort this out. Alternatively, Google may have tagged your site for suspected nefarious black-hat SEO practices, and the punishment is holding back on Rich Snippets.